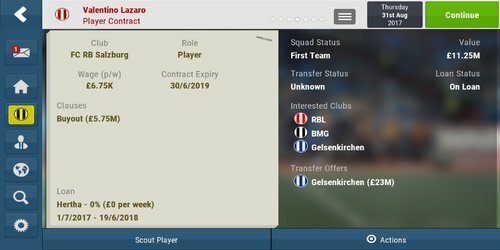 I can't bid for a player with a buy out clause in a loan deal. But I can agree a loan with a player and put one in, only to find other clubs out bid me for that player... Or in fact as the picture will show, a player is on loan with an option to buy and I can't make a bid but clearly other clubs can. Gives the AI a distinct advantage. The buyout clause on a loan deal only applies to the team that has the player in on loan. Also when you have a player in on loan and try to activate the clause other teams can out bid you and trigger an auction? For loan to buy players it should not possible for you to make a transfer offer as a third party, this is by design. If however the AI makes an offer, the offer is accepted, the offer goes through and the players is transferred, this is a bug. If this is what happens in your game can you upload a save from before the offer (or as close as possible to it) here as a zip file and include a link to this thread. 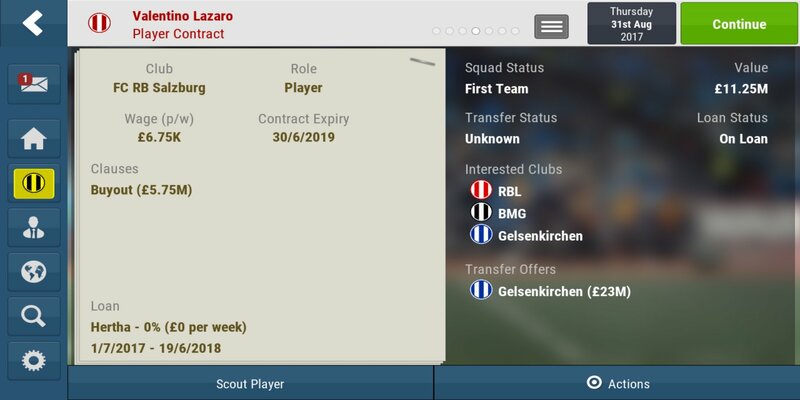 The buy out loan option is broken, if another club has a buy out loan deal I can not bid for said player but every other club in the game can. Equally if I have a buy out deal in place, any club can make a bid and what's worse is I have a deal with inter Milan for Bastoni, 30.5 million. I made the offer to buy out the loan and was greeted with a counter offer form inter Milan asking me for 47 million. I'm pretty sure that makes my option to buy out the loan pointless. This whole option in the game does not work at all. If I can't join in the transfer merry go round then other teams should not be able to compete in mine. It's completely broken and a defunct option in the game. Thanks for clearing that up Craigg4. Please could you follow the steps set out above by James in the post above your last one so we can take a look at this issue?